There are many reasons people believe they don’t need an estate plan – especially those who feel they are healthy or expect their wealth to simply transfer to their immediate family. However, by formally specifying how you want your assets divided, you can avoid the expenses of probate and ensure your wishes for your estate are honored. June’s Wealth Management Insights looks at who benefits from estate planning and how a formal plan can lessen both the expense and heartache of one’s passing. 1. Your family. An estate plan can help ensure the financial future you want for the people you care about. The process of creating an estate plan forces you to account for what-if scenarios you might not otherwise consider, such as the possibility of you and a spouse passing at the same time. The promise of inherited wealth can create family in-fighting or inhibit adult children’s ambitions. An incentive trust sets conditions for the transfer of wealth, such as the age of the beneficiary or whether he or she completes college, carries on a family business or abstains from destructive behavior. Beneficiaries don’t have to be blood relatives – they can also include neighbors, colleagues, friends, and even pets. 2. Your causes. Many people – especially those with smaller families or adult children – choose to leave assets to meaningful organizations. There are ways to support your favorite charities without denying support to your loved ones. A charitable remainder trust, for example, transfers the wealth – and tax burden – to the receiving charity while still providing for trust beneficiaries. If you’re planning on leaving assets to an organization, consider developing a relationship with them and watching how they handle their funds. That may give you insight into how your gift would be used. 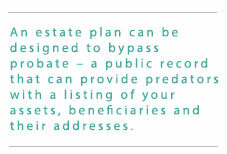 An estate plan is often considered a final statement to the world of how you want to be remembered. Think about what organizations and causes reflect the beliefs and values you hold most dear. 3. You! An estate plan can also be structured to provide certain benefits during your lifetime. A comprehensive estate plan includes more than just a will – it can also involve creating a durable power of attorney, which allows someone you trust to make financial decisions on your behalf if you become incapacitated, and a health care directive, which lays out your wishes for medical care. Estate planners have tools to help lower your tax liability. For example, an irrevocable life insurance trust can transfer the proceeds from an insurance policy to the trust’s beneficiaries without getting taxed as part of your estate. An estate plan can establish directives for long-term care. These expenses are not typically covered by Medicare or employer-based medical insurance. By creating a formal plan with specific directives for your estate, you can be sure the people and causes you care about will be supported. 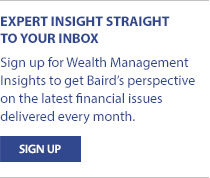 Your Baird Financial Advisor can work with your attorney to help you create a plan that affirms your values and gives you peace of mind, come what may. Robert W. Baird & Co. does not offer tax or legal services.